What is the Stand Up Paddle? This video amazed everyone because it takes a lot of power to take off a foil without being carried by the swell. Stand up paddle surfing and stand up paddle boarding (SUP) is a surf derivative from Hawaii. Unlike traditional surfing where the rider sits until a wave arrives, paddlers stand on their boards and use a paddle to propel themselves into the water. Sport was documented in a 2013 report that identified it as the outdoor sport activity with the highest number of new participants in the United States that year. Variations include flat water paddling for outdoor recreation, fitness or tourism, running on lakes, large rivers and canals, wave surfing, paddling in river rapids (whitewater SUP), paddle board yoga and even fishing. Standing paddlers wear a variety of wet suits and other clothing, depending on water and air temperature, since most of their time is spent standing on the board. A related traditional sport, paddleboarding, is practiced by kneeling on a board and paddling with your hands, like a butterfly stroke. The term “paddleboarding” is sometimes misused to refer to stand up paddle surfing. Historian and writer Steve West has argued that the contemporary notion of stand up paddle boarding, if attributed to the Waikiki Beach Boys of Oahu in the 1960s, considers that canoeing should be recognized as the direct link between the idea of standing on a board and propelling it with a paddle, since individual SUP skills (board riding and paddling) already exist, used by people who have traditionally grown by learning them. 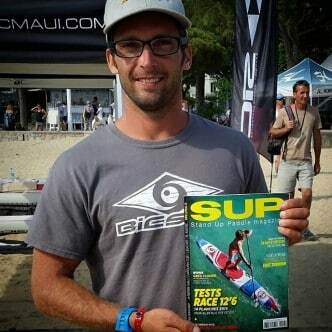 The ideal conditions to practice the SUP is a simple flat water, without winds, as here in the bay of St Jean de Luz. Stand up paddle boarding (SUP), the act of propelling yourself on a floating platform with a paddle or pole, goes back thousands of years and across many continents, but its current form and popularity began in Hawaii in the 1900s. Records of earlier forms of SUP have been found as early as 1000 BC (i.e. 3000 years ago) and its iterations extend over various regions such as Peru, Israel, Italy, China and beyond. In contrast, the modern form of standing paddle boarding, using a windsurfing board, has a much clearer heritage, dating back to the 1900s and emerging from a collection of activities loosely linked by a few very specific characters, such as Duke Kahanamoku and Dave Kalama. Once he reached California in the early 2000s, the standing paddle formed four epicentres, each with its own fountain head: Rick Thomas (San Diego), Ron House (Dana Point/San Clemente), Laird Hamilton (Malibu) and Bob Pearson (Santa Cruz). From there, the sport gained exponential popularity and California served as a catalyst for global adoption. In 2005, SUP, which until then had been almost entirely a surfing discipline, began to diversify into running, tourism, rivers, yoga and fishing. Its surfing heritage and its various disciplines have made the sport attractive and accessible to everyone around the world, paving the way for its global growth and enthusiastic adoption. In the early 2000s, Archie Kalepa and the Hobie Dream Team gave the world an indication that standing paddleboarding had a much greater potential than waves. Kalepa began to participate unofficially in cross-channel races between the Hawaiian islands, making him one of the ancestors of the downwind paddle race. Meanwhile, in California, three outstanding athletes (Chuck Patterson, Colin McPhillips and Byron Kurt) joined forces to represent the new Hobie SUP Race Team. 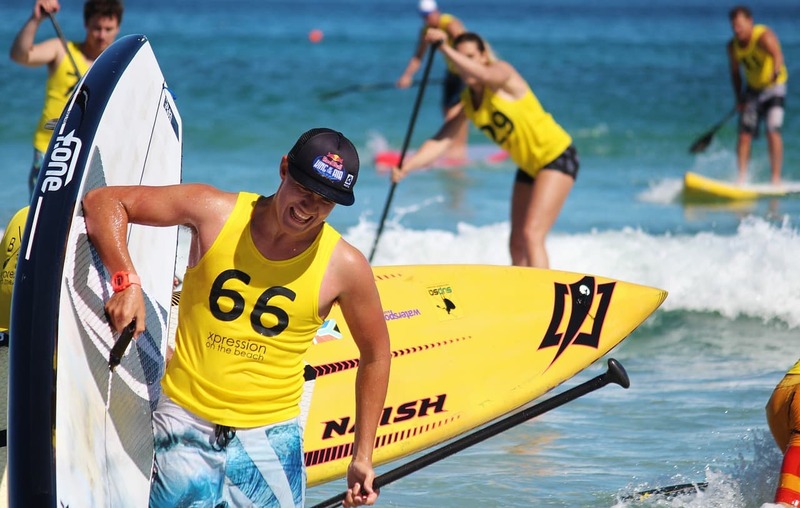 These three people were competing in local paddleboard races, which were just beginning to have SUP divisions, and were showing not only performance, but also research and product development. Everyone carefully pulled their boards into and out of the board bags, trying to keep their advantage in product development on the emerging racing scene. Feeling and developing this movement of still water, Ernie Brassard (with Rick Thomas, Bob Pearson, Blane Chambers and others) organized the first SUP event and race in the world’s lands, held at King’s Beach on the north shore of Lake Tahoe, California. It has been nicknamed “Ta-hoe Nalu” and still works today. This event in 2007 was probably the first event in the world dedicated to standing paddling. Around the same time, Nate Brouwer founded the paddling company “Tahoe SUP”, moving away from the legacy of surfing and diving wholeheartedly into the flat waters of the internal market. The SUP originated in Africa where it was common practice for individuals to stand on their canoes and use their paddles to propel themselves forward. This method has been used by warriors to attempt stealth attacks. The contemporary form of the sport began in the 16th century when Hawaiian surfers would surf on boards up to 5 metres long. These surfers used a paddle to operate boards that were otherwise difficult to handle. SUP continued in Tel Aviv in the 20th century when rescuers stood on wide boards to ensure a clear view of distressed swimmers. The rescuers used a paddle to propel them quickly into the water to rescue the swimmers. In the 1940s, surf instructors Waikiki Duke Kahanamoku and Leroy and Bobby AhChoy started the SUP as a way to stand on their boards during incoming waves, known as Beach Board surfing. In the 1990s, the SUP was taught in Hawaiian surf schools as an alternative to surfing when there was little swell. This practice has become increasingly popular and surf instructor Brian Keaulana decided to add Beach Boy Surfing to the Buffalo Big Board Contest in 2003. 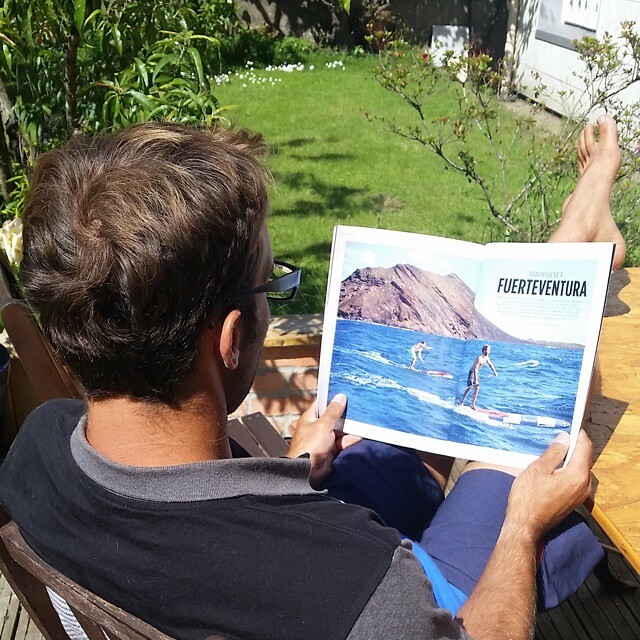 The response to this new category has been overwhelming, with many well-known surfers choosing to participate. SUP races have become commonplace; in 2012, Kai Lenny won the final of the season’s first Standup World Series Championship races. The first sports magazine, Standup Journal, was founded in June 2007. In 2007, the concept of paddle boarding on still water began to take on a serious form and a year later, the first manufacturer of touring boards, Tahoe SUP, launched the “Woody” and “Zephyr” as specially designed flat water paddling boards. Since 2008, Tahoe SUP, led by its founder Nate Brouwer, has been leading the touring industry with innovative designs and materials that differ from those of surfboards. Tour Paddle Boarding has become a way for individuals to seek adventure, serenity, personal achievement and a deeper connection with nature. 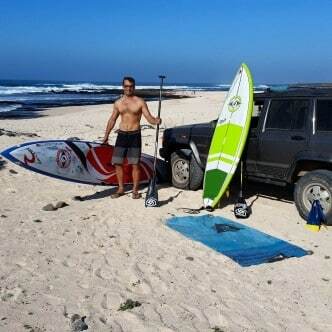 Brouwer has introduced a new shape, different from traditional surfing styles on the market and has created a more accessible leisure activity that can be taken inland; the hiking board can carry additional equipment and has a more efficient hydro slide. With a Piercing displacement hull, increased volume to carry a payload and lowered stabilization platforms, the design of touring surfboards differs considerably from that of SUP surfboards. Brouwer met with several manufacturers and distributors of still water kayaks to create features that would provide more comfort, stability and efficiency. One of the main features of these interactions was the installation of bridge plugs. It is an integrated system designed to secure external cargo. The first kayak store to distribute a hiking paddle board was Tahoe City Kayak, and now has additional rentals, lessons and equipment sales. The ultimate emancipation of the SUP returned to its roots when the SUP fishing boards went into production. Among the first were the Lane family in San Diego, then a few people off Cabo San Lucas, but it was only in Florida that SUP fishing became a certifiable chapter in the history of the SUP. Corey and Magdalena Cooper, of Destiny, Florida, launched BOTE SUP, a standing paddling company mainly dedicated to fishing. Now, the SUP fishing industry has inflatable boards like the Fish Stalker Pro to be more easily transported. And with that, standing paddling became a very diversified discipline and its basic foundations were then in place. Nikki Gregg (Oregon) started doing physical training sessions and pilates on standing boards. Sarah Tiefenthaler (Orange County, California) and Gillian Gibree (San Diego, California) added a slightly different twist by bringing their yoga classes to the water on SUP boards like the YoFit. 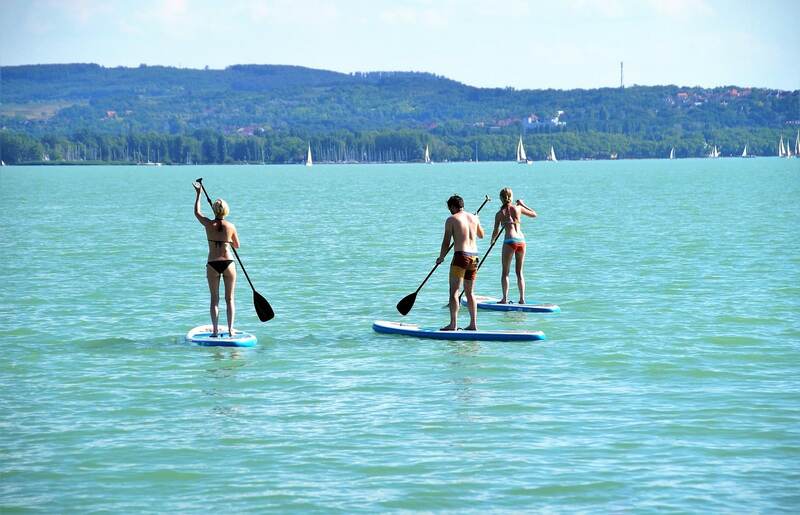 Popularity According to the Outdoor Foundation’s 2013 Outdoor Participation Report, stand up paddle boarding is the most popular outdoor activity among new participants. The report indicated that the median age of standing paddle boarding was 28 years. The Outdoor Foundation’s 2015 Special Report on Paddle Sports revealed that 2.8 million (or 0.9%) Americans participated in standup paddleboarding in 2014. This is an increase from the $2.0 million in 2013. The 25-44 age group was the highest percentage of all contributors (47%). The highest participation rate was among adolescents aged 14 to 17 (1.8 per cent), with men accounting for 76 per cent of this age group. The prices of the new SUP panels range from US$600 to US$3500, and most use a glass reinforced plastic construction using polyester or epoxy resin compatible with the polyurethane or expanded polystyrene foam used in the core. Some SUP panels use a hollow wooden construction instead of foam with epoxy resin. Thermo SUP panels are manufactured by Koreguard™ and is a patented hybrid construction process, developed from thermoformed ABS sheets and composite materials to build highly durable, maintenance-free and abrasion-resistant panels. This cleaner and more environmentally friendly process also significantly reduces the number of consumables in production, recycles ABS scrap and creates a more durable board. In recent years, inflatable boards have also been introduced. Boards are generally longer than 9 feet (2.7 m), and can be longer than 12 feet (3.6 m), with features such as padded decks and concave hulls; they generally have one or three surf-type fins in the stern for tracking. The boards can also be as short as 7 feet, typically made of high performance carbon fiber. Such boards are used in Stand Up Paddle Surf competitions (smaller boards are more manageable). Race boards, which range in length from 12 feet 6 to 14 feet, are usually made of fiberglass or carbon. Performance surfboards were traditionally made from layers laminated on foam cores. SUPs are larger boards and the desire to travel with them has led to the development of an inflatable system where the board and pump can be carried in a backpack. The core material is called the “drop point”. Thousands of locked nylon stitches hold the board to a specific thickness. The pressure of specially designed hand pumps can inflate a board to more than 30Psi. This creates a board that is not much less rigid than a hard board. This makes the inflatable padded boards both durable and transportable. Riverine SUP boards experiment with different fabrics and polymers to support the abuse of the board in the river. Boating safety is practiced and regulated by a wide range of overlapping authorities. In many parts of the United States, SUP surf is treated like bodysurfing, boogie boarding or other forms of surfing. There are no regulations requiring the use of a personal flotation device (PFD) when using a SUP board in the surfing area. 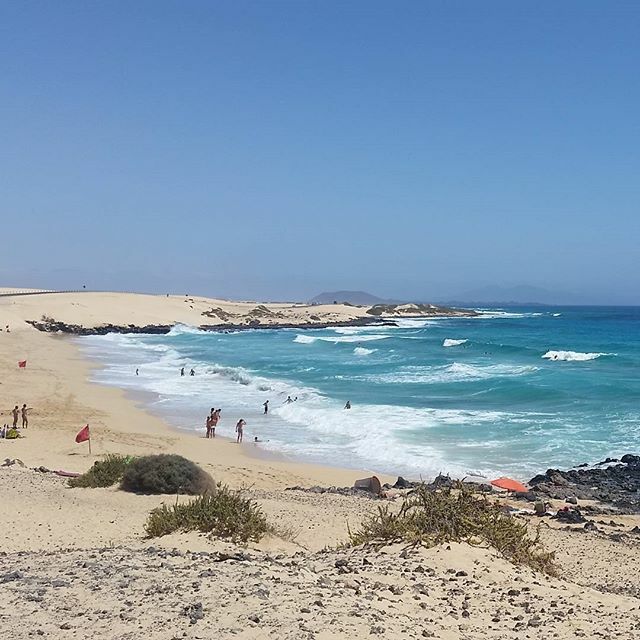 However, jurisdictions and rules requiring PFDs may vary depending on the type of water: surfing area, inland waters, ports and other inland waterways. The U.S. Coast Guard has classified SUPs as ships, such as canoes or kayaks. Therefore, SUP runners are required to wear a PFD when paddling in certain areas outside the surfing area. In addition, areas such as Myrtle Beach, SC or Virginia Beach, VA closely regulate beach and surfing areas, requiring the use of leashes on a SUP board similar to the law for surfboards. These regulations and requirements can be applied seasonally during busy tourist seasons or year-round. In addition, it is important to use a quick release belt when paddling in whitewater, as it allows the paddler to safely detach himself from a tangled leash. There are no regulations requiring the use of a personal flotation device (PFD) when using a SUP board in surfing. In flat waters, local regulations may require the use of a PFD, for example on lakes, rivers and inland waterways. In an educational environment, SUP schools and clubs may require the use of PFDs for less confident paddlers. The use of a leash is always recommended in all paddling environments and is a key component of safety equipment. Specific leashes are designed for specific uses of the paddle board. A standing paddle is used to propel an individual across the water surface while standing on a surfboard. The pallet consists of a blade, a handle and a handle. The paddles used for standing surfing are similar but longer than traditional canoe paddles. They are generally made of carbon, fiberglass or wood with a flat blade at one end that connects to one handle at the other end by a long smooth handle. The width of the blade varies from 6 to 10 inches with an oval or round stem from 67 to 86 inches long and from 1 to 1.5 inches in diameter. The blades are designed with several shapes and characteristics. Normally, the blade is shaped like a banana peel, sometimes with a slight keel at the back of the blade. Other commonly used forms are diamonds or oars. Different blade shapes are sometimes used for different types of paddling conditions (e.g. long distance, flat lake water or ocean surfing). The appropriate shape for paddle surfing requires a paddle of the right length and size. A common rule of thumb is a shaka length, or 5 to 7 inches, above the rider’s height for surfing and about 10 inches above the rider’s head for running. The pallets are held with two hands, using a wide handle instead of keeping the hands together. The right way to hold the paddle is to tilt the blade away from the body. This propels the paddler into the water faster. The push-pull method is the most effective way to paddle when boarding a standing paddle. This method requires gently inserting the paddle into the water in front of your feet, pulling it back and lifting it out of the water.